This set is a complete routine to equalize and improve your normal to oily skin type. 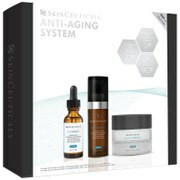 This set addresses breakouts, wrinkles, blackheads and enlarged pores. These products contain no added dyes, are 100% fragrance-free, and are clinically proven to be non-irritating. Refresh your normal to oily or combination skin with this light, cushiony cleanser that effectively removes all makeup (including eye makeup). Restore skin's healthy balance and reduce enlarged pores with this lightly hydrating, weightless solution. A silky, toner-like consistency enhances penetration to maximize exfoliation. This weightless combination of potent bioactive ingredients (including Retinol) forms a breathable barrier to protect and normalize skin. Rejuvenate your skin and restore healthy cell function with this weightless, mattifying moisturizer. This weightless gel contains antioxidants and Niacinamide, in a shine-free gel that generates healthy, younger skin cells. This unique mask absorbs excess oil and help dislodge blackheads. Skin Balancing Oil-Reducing Cleanser: Use morning and evening. Splash the face and eyes generously with tepid to slightly warm water. Apply a small amount of cleanser to your face and eye area with vigorous yet gentle circular motions. Rinse well. Repeat or use with a clean washcloth to remove heavy makeup. Follow with the appropriate Paula's Choice toner to give your skin a generous amount of potent antioxidants and skin-renewing ingredients. Next, apply your Paula's Choice exfoliant, serum, and/or moisturizer. Skin Balancing Pore-Reducing Toner: Use morning and evening. After cleansing, apply to a cotton pad and gently stroke over face and neck. Do not rinse. Follow with your Paula’s Choice exfoliant, moisturizer, and/or treatment product. For daytime, follow with a product rated SPF 15 or greater. Skin Perfecting 2% BHA Liquid Exfoliant: Dispense approximately a dime-sized amount onto a cotton ball or pad and stroke over clean skin, including around the eyes (do not apply to eyelids or along the lower lash line). This product may also be applied with your fingers. Do not rinse off. Follow with Paula's Choice Clear Acne Fighting Treatment (if needed), moisturizer, and/or specialty product. For daytime, wear under a product rated SPF 15 or higher. Skin Balancing Super Antioxidant Concentrate Serum with Retinol: Apply morning and evening after cleansing, toning, and exfoliating. Smooth a few drops onto face, neck, and eye area before moisturizing (or use alone). For daytime, follow with a product rated SPF 15 or greater. Works beautifully under makeup (as foundation primer) and is suitable for use around the eyes. Skin Balancing Ultra-Sheer Daily Defense Broad Spectrum SPF 30: Apply liberally before sun exposure as the last step in your morning skin-care routine. Allow a moment to dry before applying makeup. For extra sun protection and to create a flawless finish, follow with a Paula’s Choice foundation and pressed powder with sunscreen. Skin Balancing Invisible Finish Moisture Gel: Apply morning and/or evening after cleansing, toning, and exfoliating. Ideal for treating face, neck, and eye area. For daytime, follow with a product rated SPF 15 or greater. Skin Balancing Oil-Absorbing Mask: Use on cleansed skin. Apply a thin layer all over the face and (if needed) neck and let dry for 10–15 minutes. Rinse thoroughly with tepid to warm water. Follow with the appropriate Paula's Choice Skin Perfecting exfoliant, CLEAR Acne-Fighting Treatment, moisturizer, and/or specialty product. May be used as often as needed. Those with oily to very oily skin can use this mask several times per week, while those with normal to slightly oily skin can use it less frequently (once or twice per week, for example).